Chronic bronchitis is an inflammation of the airways, called the bronchi, resulting in excess mucus production. Although infections often result from this form of Chronic Obstructive Pulmonary Disease (COPD), they are not typically the cause. An infection may produce acute bronchitis, a similar condition that can last days or weeks, but chronic bronchitis is persistent, lasting months or as is often the case, indefinitely. The linings of the airways contain cells that naturally produce mucus, which the body uses it to trap irritants and disease causing organisms. Small hair like structures called cilia then move the mucus up the airway where it can either be coughed up or swallowed. That process is actually healthy, since it clears harmful substances from the body. Unfortunately, chronic bronchitis causes the body to produce more mucus than the cilia can handle and, at the same time, the cilia themselves tend to become weaker. As a result, a chronic cough can exist. That cough typically produces white or clear sputum or phlegm. The presence of yellow green sputum is a sign of a secondary infection, often from a virus such as influenza. Though sometimes called a smoker's cough, folks can contract bronchitis without ever smoking. Still, while the underlying causes are not known, smoking is one of the major risk factors. It is also possible to get bronchitis from repeated, heavy exposure to chemicals such as ammonia and sulfur dioxide to name but two. 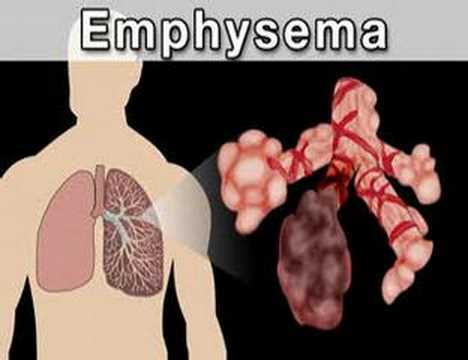 Typically, that type of bronchitis tends to clear up once exposure has been discontinued. The cough tends to be worse in the morning, since mucus accumulates in the airways during sleep. In advanced cases, especially when accompanied by a secondary infection, sleep may be disrupted. Those afflicted may find it helpful to sleep sitting up, at least temporarily. There are several preliminary tests called Pulmonary Function Tests or PFT that are performed to diagnose chronic bronchitis and distinguish it from emphysema, asthma, and other lung diseases. In addition, an ordinary x-ray may be used. However, unless the disease is far advanced, it may tell a physician little although they are typically taken anyway to rule out lung cancer or other possible problems. Instead, a CT or PET scan is often recommended in order to get a clearer picture of the lungs and airways. There is no known cure for chronic bronchitis. In rare cases, the condition may reverse itself. Typically, though, it persists and often gets progressively worse over the years. However, it need not be fatal, since patients with moderate cases can have a normal life span. Since it tends to begin around age fifty or later, mortality may well result from any other cause. Drugs, such as corticosteroids, can be used to treat symptoms and ease discomfort. However, they have harmful side effects when used long term and physicians will weigh many factors before recommending them. Fortunately, there are several other alternatives. Lifestyle changes are generally necessary, particularly stopping any smoking and limiting exposure to second-hand smoke. Some exercise can help maintain lung capacity, but reduced activity and workouts that are more moderate are usually recommended.